Excels Suede and Leather provides suede and leather cleaning services to the dry cleaning industry. This is in addition to Excels core fashion-processing business to large conglomerates such as French Connection. 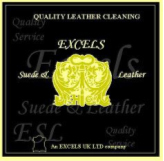 We here at Excels suede and leather (ESL) endeavour to provide you with all information regarding care and cleaning of suede and leather products. The list below gives you more details of our cleaning process. There is also a comprehensive fact sheet on leather care. Further more we at Excels are currently operating a FREE leather cleaning voucher introductory offer. This voucher offer applies to all of our current account/non-account dry cleaning and laundrette customers. You can simply download our Free cleaning voucher here and contact our office for your first collection. Our aim at ESL is to reduce your cost and provide a reliable service, without compromising quality. We save you considerable money because our prices are competitive. Prices start at only £18.50 per jacket. FREE collection and delivery service to your door. We agree and stick to an agreed price. We also provide an unparalleled after sale service. This is to ensure that the dry cleaner and their customer are at all times informed and supported regarding the cleaning of their garments. Especially in the rare event of damage to a garment, the dry cleaner and their customers receive full support. For any queries regarding Excels Suede and Leather service, please contact our office directly.